Soak the dried karamani for 5 to 6 hours and cook and keep aside. Roast the rice flour well in a dry kadai till it gives out a good smell. However do not roast till it turns red. Remove from Kadai. Heat the kadai (FRYING PAN) and add oil and mustard seeds. When the mustard seed splutters add chopped chillies and curry leaves. Toss for a few seconds. Pour water in the kadai and bring it to a boil. Reduce flame and add rice flour and mix well. Add karamani, grated coconut, 1 tlbs of oil and required salt and blend well till a nice thick paste is formed. Take it off the heat and allow to cool. Grease your palm with oil or use a small plantain leaf. Roll the dough into balls and flatten them to about ¼ inch thickness. Make a small hole or dent in the centre to allow it to cook evenly. Grease idly plates and steam the adais [adai – a dish that has a thin spread of batter/dough] till done [roughly 8 to 10 mins]. Serve with a fresh blob of butter. Steaming is perhaps the oldest form of cooking – even before the cave man discovered fire. It is said that food was softened over hot springs or stones in ancient times. Steaming is a moist method of cooking that combines hot air and moisture to soften and cook ingredients. Steaming is a preferred method of cooking for the simple reason that it retains the nutrient factors when compared to other forms like baking or frying, retaining color, flavor as well as texture. Research has established that steamed food only showed a loss of 40% vitamins in vegetables compared to 70% that is lost when the same is boiled. All the essential goodness is retained and there is lesser requirement for fat too. Food is not exposed to intense heat as in other methods. Choose ingredients and ensure that they are of good quality and not rotten or stale. The reason for this is steaming enhances flavors and any ‘unwanted’ aroma or flavor will only get accentuated. Make sure that the vessel containing the ingredients is placed well above the water and there is no chance of the outer liquid entering the substance. Ensure water levels are adequate to complete cooking. To save on fuel bring all frozen foods to room temperature before steam cooking. Curd rice is a staple food for most South Indians especially Tamil Brahmins. When affected with a severe cold or Chest Congestion intake of curd is generally avoided. For those who find it difficult to keep away from curd diluted and churned buttermilk can be heated with turmeric powder and then consumed mixed with rice. Turmeric helps in relieving the cold and congestion. Mix curd & water and churn well to make a smooth liquid. Add all other ingredients and mix well. 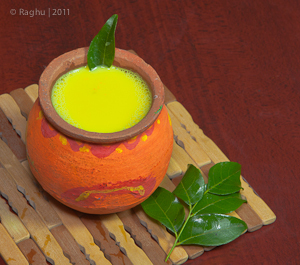 Pour into a kadai and heat it on low flame but ensure it does not boil too much since the curd will disintegrate. Alternatively you can boil the turmeric powder and water for 30 seconds and then lower heat fully and mix churned buttermilk and switch off the stove after a few seconds. A few curry leaves can be added for added flavor. Although a very famous eatout situated at a very good place in West-mambalam, we had quite a bit of a difficulty finding it out. Its quite close to the Mambalam Railway station and is put up at Subbu street (Subba Rao Street), off Lake view road. Only when we were quite close to the place, we stopped to take directions and everyone in that area knew about it. My husband enlightens me a bit about west mambalam being one of the hot-spots for mansions hosting a lot of bachelors. I found the same crowd in the mess when I entered. No family crowd at all. There were only benches and stools laid out with the quintessential banana leaf or vazha elai. I feel this is the best way to serve customers in hotel. One neednt waste water to clean plates or waste electricity to sterilize spoons. Only leaves have to be chopped off the banana tree and is biodegradable too. Ambiance was also typical like a mess, where you sit, eat and get going. We did not want a heavy breakfast, so ordered 2 idlys + 1 vadai each. Items are served by hand, which I found quite normal in such places. One just has to ignore such trivialities in life. Immediately we were served with the items together with unlimited chutney (coconut & tomato-onion) and hot sambar. It was pure yumminess. They keep refilling the chutney and sambar till you finish. Still not satiated, we ordered 1 saadha dosa and 1 kal-dosa. Both were really good, again served with unlimited sambar n chutney.